The Gospel of God is the most marvelous thing in the universe. It confronts us in our sin and unbelief. It heals and restores our minds and hearts. It dispels the lies we’ve been told and obliterates the lies that we’ve lived. As His mercy shocks and transforms us, we begin to see the majesty of Jesus the Christ, and beholding Him, we are changed. We are not inducted into a new religion and handed a bag of truths. Instead, we are introduced to the Man who is the Truth in and of Himself. He is abiding, dependable, unwavering. When we see Him as He is, we are compelled to turn from sin, put down our “nets,” and follow His voice. The Gospel has the power to reverse natural circumstances. In the Gospel, blind men are made to behold the colors of the rainbow and the beauty of a child’s face. A child who could not walk can be seen “leaping and praising God.” The insane or anxiety-stricken can walk in transcendent peace and soundness of mind. Hell’s strongest and best crafted chains are shattered in a word. This Gospel jolts us with the reality of the heavenly government. There is a Man at the right hand of God who has “all authority,” and He delights in doing good. The Gospel also reveals to us that we have no life in and of ourselves. It shows us that our highest wisdom is foolishness and our greatest morality is as pure as polluted water. It shows us that we have avoided God, even in many of our best attempts at serving Him. It shows us that our view of His judgments is too light. It shows us that our view of His love is too shallow. The Living God utterly transcends every fixed category that our finite minds have sought to place Him in. “For now we see in a mirror dimly,” but as we commune with Him “face to face,” we begin to know more fully the fervency of His love and the sanity and soundness of His purposes. The apostle Paul was smacked with this revelation on the road to Damascus. Running to and fro, thinking he was doing God a service, he came to find out that the seams needed to be busted out on all sides of his theology, thought and mission. God in Christ was so much more than he ever imagined, and his best attempts toward righteousness were not only insufficient, they were entirely incapable of hitting the mark of true justification or redemptive experience. 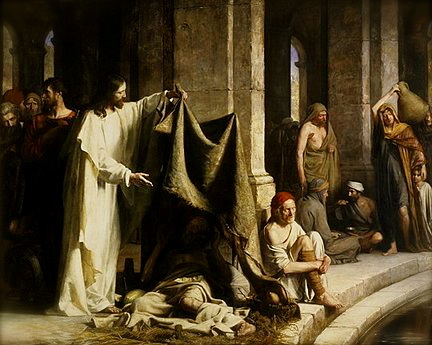 He was feverishly engaged in religious activity, but had failed to behold the Man, Christ Jesus. Missing Him, he was missing everything. Are we failing to behold Him? Are our ministries eye-turning and impressive, groundbreaking and the talk-of-the-town, yet missing everything? The Gospel shows us the kind of Person that we have never before known: One Who gives Himself completely; One Who doesn’t break His word or exaggerate; One Who possesses all power yet sacrifices Himself in all gentleness; One Who Is exactly what He says He is; One Who, in the very expression of Himself, chose to forsake His own life that we might gain life. The Gospel shows us that even though we’ve been created in His image, we are really not like God at all. We are fallen. Significantly flawed, self-absorbed in motives, easily irritated, moved by ego… the writing is on the wall. Our noses are sticking out. Our little kingdoms are tottering, and we, the self-appointed Emperors, have lost our shiny garments. We are ashamed. We’ve been exposed by the cogency of His truth, laid open by the power of His light. Yes, we are fallen. Yet, the Gospel turns over the table of man-centered government and humanistic philosophies. While we were obstinate and entirely rebellious toward Him, this message opened up to us the very wisdom and power of God Himself. We have been lavishly offered His perfect righteousness and freedom, a gift from the Father of lights. He has sent “the apostle and High Priest” of heaven, His only Son, to become the sacrifice that would split the skies open. We have access to God through repentance and faith in the Son. This Man, who is so unlike us, has torn the dividing veil that hung between us. We are not like Him, but the Gospel impacts and stuns our senses. Not only has forgiveness been opened up, but we are invited to come into His nature, to become like Him! O, the blood of the Son! It opens the gate to the palpable experience of His Spirit, through which we come into intimate fellowship with the Creator of all things. We are gloriously enabled to hear the Voice of the One Who holds time and space in His palm. We are not only made to be His servants, but His friends. The blessing of Abraham rests on us with a blissful weightiness. The window of grace is opened for us to know the Lord in reality. The Gospel is beyond phenomenal. It is the wonder of the ages. It is the unswerving expression of the Father’s kind intentions toward us. What a glory this Gospel is! Have you any wonder or awe for the Gospel anymore? Is the Gospel still to you what it was when you first believed? No wonder Jesus went preaching. No wonder His heart burned. No wonder He eventually entered a public ministry. He had good news! Very good news! He was announcing the presence of the Kingdom of the only true God. He was revealing the Father to a degree that had never before been seen or known. The Spirit of the Lord was resting upon Him, and so He prayed fervently, rejoiced incessantly, preached and taught openly, displaying the works of the Father for all to see. When He said, “Follow Me, and I will make you fishers of men,” they would “immediately” leave everything to follow this wonderful Man. How could we turn our hearts away from such a breathtaking Man and such a glorious Kingdom? There will be no price too high to pay and no sacrifice too great when we, in this final season of history, are awakened to the beauty and wonder of the Man, Christ Jesus. Would you pray with me? Lord, give us a fresh hearing of the Gospel… that foundational word that reveals Jesus to our hearts. Open our eyes again, Father. We want to see Jesus. Thanks – Bryan… HE is the centre and fulness of all things. May all our belief systems, and our all of our activities for the KIngdom be centered in this Man! He is perfect theology AND practice. What words of life! Oh that we would become as fascinated with Jesus as the early apostles where. I’m looking for a revolution of preaching that declares the mystery and majesty of Jesus again as it’s primary message (Eph 1). Thanks, Bryan. Amen and amen, brothers. May we see more fully the crucified and risen One, setting Him forth in our lives and our proclamation.